This begins what the Bible calls "The Beatitudes", which means condition or statement of blessedness. 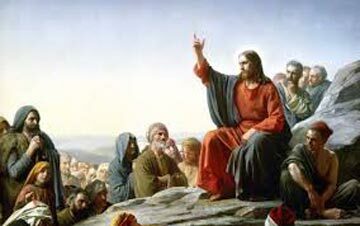 As Jesus teaches the multitudes on an undisclosed mount, He reveals the ethics or value system of the Kingdom of God, about which He was sent to preach the Good News (Luke 4:43). In the prior chapter of Matthew, Jesus called for "repentance, because the Kingdom of God was at hand". In Matthew 5, Jesus explains how repentant people should live their lives under God's rule. The world has yet to recognize the Kingdom, but by following the moral codes and standard of behavior laid out in the Beatitudes, the followers of Christ will be prepared for the Day that God will judge the world and reign on earth. Blessed are the poor in spirit; for their's is the kingdom of heaven. Without Jesus and the Holy Spirit, I am spiritually bankrupt and without moral virtue. I am like a beggar who must rely on God's Power in my spirit and in my life. Only those who recognize their poverty in spirit will be rewarded with the kingdom of heaven. Blessed are they that mourn; for they will be comforted. I express my deep grief before God for my fallen state; I recognize my depraved state and that I am worthy of His judgment and Death. But because of my humble assessment, I have found a path to God, and I will be comforted by His grace and mercy. Blessed are the meek; for they shall inherit the earth. I proclaim my willingness to be obedient, and to submit and work under the authority and power of Jesus. My reward and inheritance will be to rule and reign with Him on the earth. Blessed are they who hunger and thirst after righteousness; for they shall be filled. It will be my lifelong mission to hunger after a life that reflects Jesus. With this thirst for more of Him I will develop the character traits of mercy and a pure heart, which will result in greater intimacy with the Lord. Blessed are the merciful; for they shall obtain mercy. I will extend the same mercy to others, that my God has given me, whether they deserve it or not. For, I certainly did not deserve it, yet God stretched out His hand to me. I trust that the Lord will honor my acts of concern for others. Blessed are the pure in heart, for they shall see God. The heart is where the Holy Spirit takes up residence, and I will endeavor to live a life that maintains a heart that is genuine, sincere, and uncontaminated by the world. And with a pure heart, I know that I will enjoy greater intimacy with God, which is the ultimate goal in my relationship with Him. Blessed are the peacemakers, for they shall be called the children [the sons and daughters] of God. I pray that I can become a person of great passion for reconciliation between all people. I want to reflect the peace and harmony of heaven on earth, and to be a person of action to bring it about. Blessed are they who are persecuted for righteousness' sake; for their's is the kingdom of heaven. Blessed are you, when men shall revile you, and persecute you, and shall say all manner of evil against you falsely, for My sake. Rejoice, and be exceeding glad; for great is your reward in heaven; for they persecuted the prophets in the same manner; those prophets who came before you. Persecution is how the world will receive those of us who follow Christ, because our values and character traits are opposite of the world's thinking and the principles they embrace. But, by sharing in and enduring the persecution that our Lord and the prophets experienced, we will be declaring to the world and our spiritual Enemy whose side we are on. When the End of this Age comes, and the world is judged, we will receive our reward and inheritance as the sons and daughters, and co-heirs, with Christ. In summary, the Beatitudes convey the blessings of belonging to the Kingdom of God and the spiritual implications of Jesus's rule in our lives. These should be the spiritual attitudes, goals, and character traits of all Christians. I must admit that I have been surprised to find that a great number of Church-going Christians cannot explain the meaning or ramifications of these blessings that are a central component of Jesus's Gospel of the Kingdom. That is a sad appraisal of the state of the Church. Let us determine that from this day forward we will embody these principles so that all the world will know what it means to be a Christian, and the extent of His rule in our lives.